Sitting at the desk working on the computer for many hours can be tedious. With this in mind, several members in my company and I were discussing possible ways to alleviate this tension and came up with the idea of a Suggestion Box we would set up for the staff, requesting ideas on activities we could pursue to help us relax mentally and physically. To our surprise, we received an abundance of responses, some ideas that I will not mention here!, including several that we seriously considered. 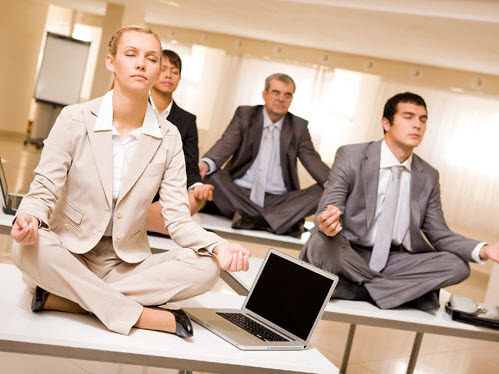 One of these suggestions came from our co-worker, Betty, who has been practicing yoga for over a year. Betty found that yoga has helped her to relax and has found it very rewarding both mentally and physically. She has offered to share her knowledge of yoga and its benefits with us as a team building activity. After presenting this to the staff they proved to be very enthusiastic and showed great interest in this suggestion. We all decided to move ahead with the planning of this team building activity. Next on the agenda was scheduling. After much discussion, we decided to divide our lunch hour into two parts; 30 minutes practicing yoga under Betty’s supervision, and 30 minutes enjoying a “healthy” lunch. Our Human Resources department offered us one of the Conference Rooms for this practice and we were ready to move ahead. As beginners we focused on the fundamentals, learned to follow the rhythm of our breath, and develop a sense of body awareness; understand alignment and avoid injury; learned to strengthen and stretch, and much, much more. This was a wonderful team building activity for all who participated and we have grown from a group of twenty to fifty. I have since become a yoga advocate and workout routinely at home. It is nice to have a break in the monotony of the day. I don’t think yoga would help me much, but I’m sure there are plenty of other options to de-stress.